In my attempt to help you decide where to go and how, I’ll start my airport reviews with my personal favorite: Munich. 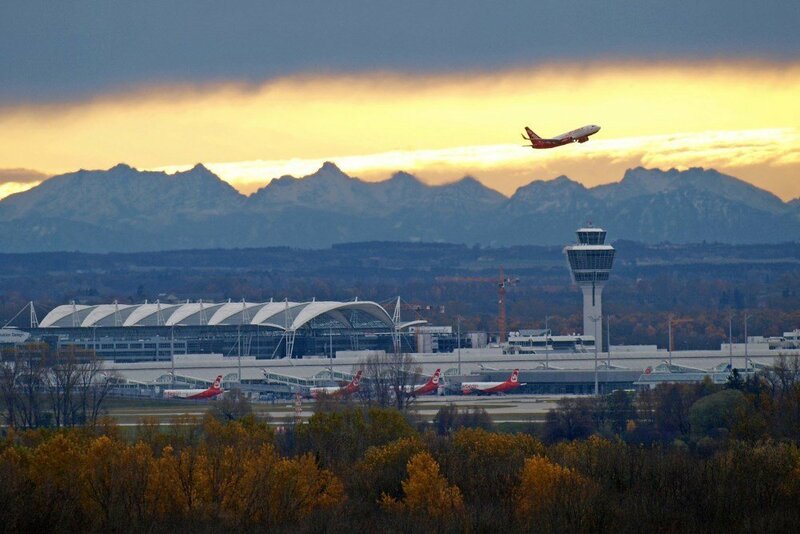 Munich International Airport or Flüghafen Munchen is in my opinion the best international airport to fly to if you intend to go to Tirol in Austria. And if you’re going hiking or trekking in the Alps, chances are that’s exactly where you want to go! For example, Innsbruck, Mayrhofen, Kitzbühel, Sölden and even St. Anton are all roughly within a 3 hour drive. That’s, of course, with the assumption that you don’t get stuck in traffic: the famous German Stau (that’s a traffic jam) does happen now and then. In any case, the roads are excellent and you’re practically on the Autobahn just as you drive out of the airport. Munich is also surprisingly convenient if you’re going to Südtirol (South Tirol) or the Dolomites in Northern Italy. Even though there are international airports closer geographically, the excellent roads and other Pros for Munich (See below!) make it a viable option even if it does seem weird flying to Germany and driving through Austria to get to Italy. For example, we drove from Munich airport to Val Gardena in roughly 4 hours for a skiing trip. One summer we drove from Riva Del Garda (at the north end of Lake Garda) to Munich airport in about 5 hours. It was nonstop and quite a drive but there was also considerable traffic. Even though Venice and Milan are both closer to Garda and Val Gardena (and the rest of Südtirol, for that matter), I would most likely choose to fly to Munich. This is especially true if I wanted to go to Tirol and Südtirol both. It does happen: Stau on the Autobahn! The Autobahn is the quickest and most convenient drive, especially if you arrive at night and have to drive in the dark. You may know that for a lot of the Autobahns in Germany there are no speed limits. Driving without speed limits is an interesting experience if you’re not used to it and it takes a little getting used to at first. You can cruise along at 200 km/h (125 mph) or more and find that Porsches and BMW’s are just whizzing by… flashing their lights and honking their horns if you’re in their way! A word of caution: The no speed limit only applies in Germany and even there only on select stretches on the Autobahns. In Austria, Italy and everywhere else speed limits apply. If you prefer a more scenic route from the airport to the mountains, I recommend exploring the smaller roads that take you into Austria across the mountains. You can go around Munich on the Autobahn and then take smaller roads to the mountains. 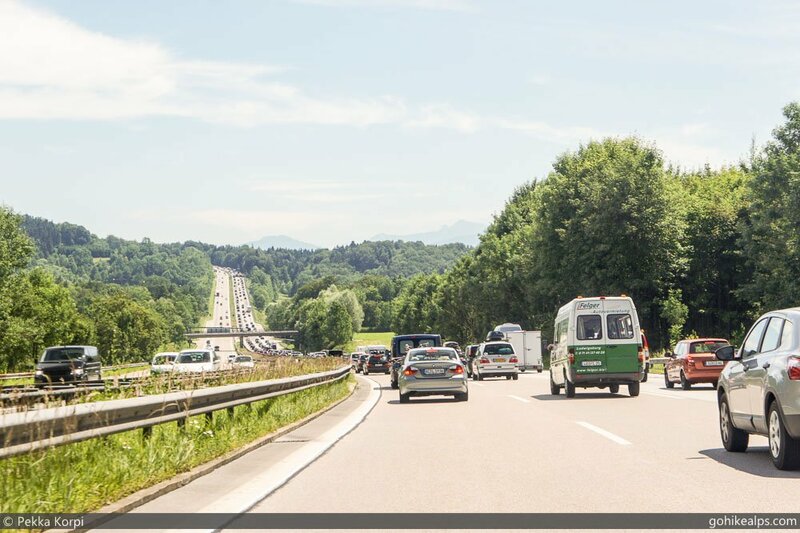 For example, you can take the Autobahns to Garmisch-Partenkirchen (unless you cut some distance and drive right through Munich) and continue on smaller mountain roads from there. Driving on the mountain roads can sometimes be slow, and there’s often traffic there, too. After a long flight it could be a little heavy. Nevertheless, as long as the weather is nice I really prefer this since it’s pretty sure to get you into a mountain mood no matter how much you did or did not enjoy the flight! … Munich airport continues to deliver. There’s a train station right at the airport. Check Deutche Bahn for train schedules and ticketing info. Depending on where you want to go and what type of trip you’re planning, taking a train might make a lot of sense, e.g. you know you’ll be trekking from place A to place B and don’t want to go back somewhere to get your car. Keep in mind that you’ll most likely need to switch trains once or twice. If you want to get to Mayrhofen, you’ll most likely first take a train to Ostbahnhof on the east side of downtown Munich and switch to another train to take you to Austria. 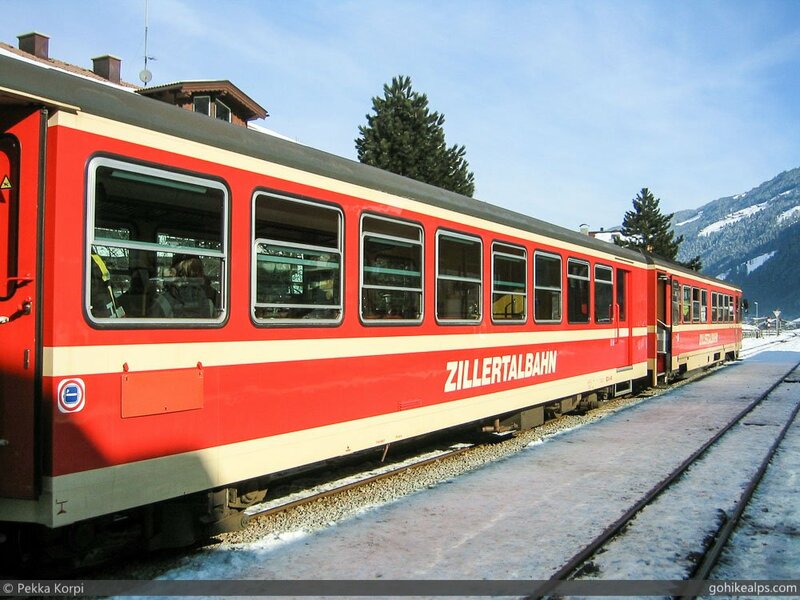 In Austria, you would then hop on the Zillertalbahn – a local train that runs all the way to Mayrhofen. I like trains and it’s a really nice way to get around in most parts of Europe, the Alps included. I still find myself opting for a rental car most of the time because they’re relatively cheap and I like to explore without being tied to timetables of trains and buses. Also, often there is a lot of stuff to carry and if you’re going into the mountains for several days, leaving your extra stuff in a car is just easy. Absolutely a great place to visit and I recommend it, if you have the time. It’s one of the most well-connected airports in the world. 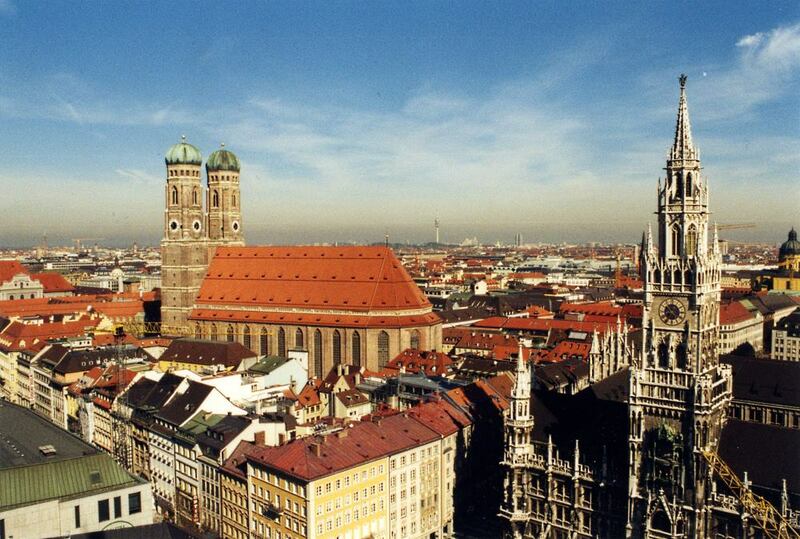 No matter where you come from, Munich is easy to reach and you can usually find flights at reasonable prices. The airport is modern and it works. I’ve never lost a bag there, queuing is normally bearable and prices at the airport are reasonable. It’s really easy to drive out of the airport and get on the Autobahn. If you want to get a cool German car like a nice BMW – SIXT has them and their choices at Munich Airport are really good even though they are often more expensive. If you know you’ll be driving a lot, it will be more fun if you have a nice car. That goes for both the Autobahn and the winding Alpine roads. If you prefer not to drive, the train station at the airport allows access to downtown and from there you can take a train anywhere you like. If you’re planning to go to Austria, I recommend taking the train to Ostbahnhof on the east side of the city and switching there. Munich in itself is a very cool place worth a visit. If you have the time, go. No point taking the car downtown, though. Cons for flying into Munich Airport? It’s not in the mountains so there’s a little extra drive or train ride. But it’s close enough that for me it’s not a problem and makes no difference. Other than that, I can’t see any. What about Innsbruck? It is in the middle of Tirol. It sure is. Innsbruck is smack in the middle of Tirol and an absolutely wonderful place to go visit. It’s, of course, right in the middle of Tirol so it’s automatically closer to all the cool places to go hike. And yes, it’s also a good base to go hiking because it’s right in the middle of the mountains, too. I prefer Munich for the international connectivity and the airport itself. Innsbruck gets a lot of flights from European cities to the point that it is often way too crowded and seriously at maximum capacity. Furthermore, as far as I know, there are no direct flights from overseas. I suspect the airport just can’t handle wide body airplanes because it’s in a narrow valley surrounded by high mountains. 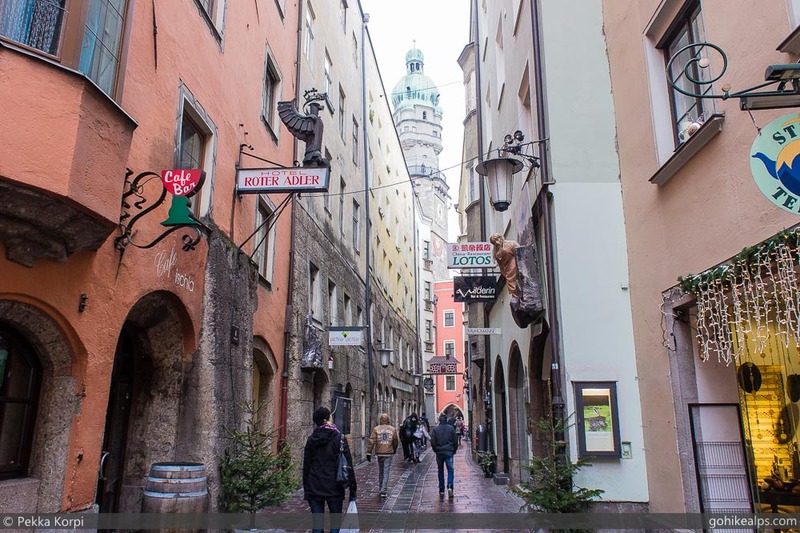 From the U.S. or anywhere in Asia you can most likely get a direct flight to Munich but never to Innsbruck. That means there’s probably a connection in Frankfurt, Vienna, Amsterdam or any of the other major European hubs serving Innsbruck. You’ll end up spending more time flying and waiting at airports so you might as well just fly direct to Munich. I’d love to support Innsbruck here, but Munich continues to be my favorite airport for accessing Austria and Süd Tirol. Please do comment if you think different! This is a great blog, full of really useful information! I agree, Munich is a great base for exploring the Alps. 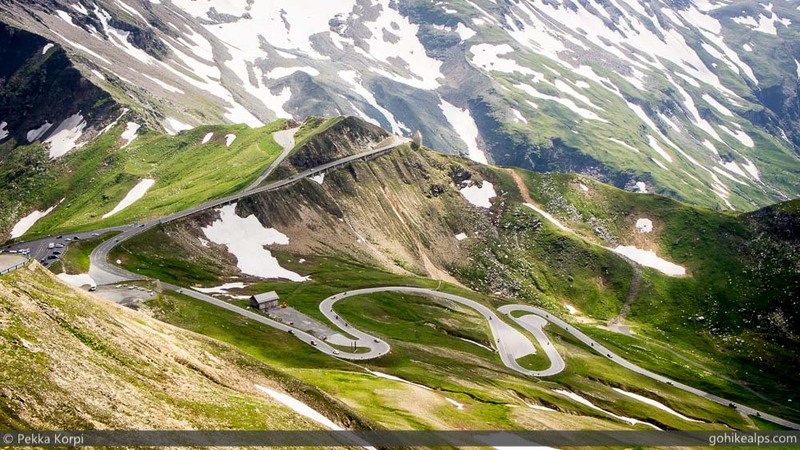 I live in Munich and love how easy it is to go to so many exciting destinations in the mountains, particularly in Austria and Italy. I would just recommend anyone planning to drive from Munich to Südtirol to check the Bavarian school holidays calendar first. Saturdays above all during the Winter, Easter and Whitsun holidays can get very busy, with long queues at the Brenner. In that case, I would opt for the train instead of a car. Thanks, Marketa! Very valid point about traffic. In my experience Saturdays during summer overall and especially towards the end of July and August tend to be rather busy on the roads. Hi! I’ve found this website very usefull for planning my upcoming trip to dolomites! Thank you very much. Nonetheless, I have two questions regarding your planning! 1) Did you rent a car in Munich and delivered it in Bressanone? Is this ok to do? I’m also flying to Munich. 2) After you left San Pellegrino, how did you come back to a bigger city (such as bressanone)? How many days did it take to get there? Did you drive back to Munich from Italy? 3) I have a slightly different planning for Alta Via 2. I will follow the classical route suggested on “cicerone”guide. But I’m worried about the day from rif. pisciadu to rif. Castiglioni, seems to be a long way. This should be feasible in one day, right? I’m taking an easy day afterwards, will stop in Malga Ciapela. Hi Catarina – Glad you found my site useful! 1) We rented in Venice because after AV2 we continued our trip to elsewhere in Italy and Venice was most convenient for that. Munich works just as well. We parked the car at a hotel in Bressanone, picked it up and continued our trip. (so we rented the car for the entire time and paid for the parking). If we would not have continued elsewhere in Italy on the same trip, we would not have rented a car at all and would have taken a train to Bressanone. 2) We walked a long mountain route to Moena, took a full day. Theres also direct buses. From Moena we took a bus-bus-train combo the next day to get back to Bressanone to pick up our car and still drove to Lago Maggiore on the same day with no troubles at all. The buses took us to Bolzano and from there you can take the train all the way to Munich. 3) In my opinion it’s definitely feasible as long as you’re in decent condition and the conditions on the trail are ok.
As long as you plan around their schedules, public transport works well on this trip. If you don’t need the car for something, I would consider taking a train to avoid having to go back to Bressanone.